The HV sealed connector series is an improved version of the existing HX sealed connector series and it is a highly reliable connector series. 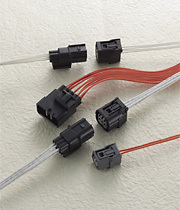 Also the HVG sealed series is what is added a finger holding portion to the side wall of the female connector of the HV sealed series so as to improving matting performance. It has a mechanism that detects terminal incomplete insertion.